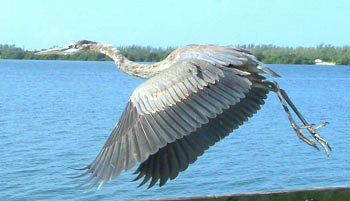 Anna Maria Island is known as a bird sanctuary and is home to several rare nesting shore birds. The 2009 Manatee Audubon Christmas Bird Count made history, hitting the 100 species mark for the first time, with 13 more species identified than the record-breaking 87 species identified in 2008. Great blue herons are among the birds counted during Audubon’s 110th Christmas Bird Count last week. BRADENTON BEACH – Something small and fragile is making noise in the mangrove bushes on Leffis Key as John Ginaven walks by, followed by a binocular brigade. Coming to a silent stop like troops on patrol, they wait, listening and watching. Cameras are raised. Binoculars are focused. The bird moves and the jig is up. Whispering turns into excited chatter, as David Williamson flips open a bird identification book to narrow the choices. Can you see its belly? Is it yellow? How many bands are on its flank? Are there white circles around the eyes? Is it a male or a female?